Bought new blade but guide dont work now it goes into wheel cant bring up to max height anly about 4 inches. Any suggestions..
Max cutting height is advertised as 4-5/8in. and it is possible that it might be slightly less than that on individual saws. I get just slightly over that on mine. Blade length should be 70-1/2in. Sounds like you bought a longer blade? I was thinking cutting height on that saw was 13” Did you get the right length blade? Yes, that saw has a 13” resaw height & uses a 111” blade. Are you sure the saw is the 10-325 and not the 10-305 10”? 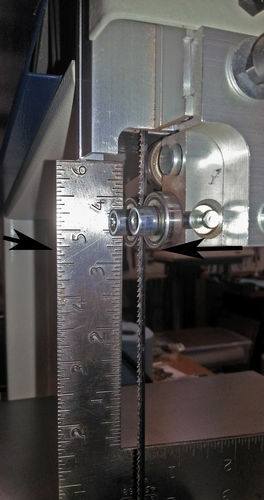 The 305 has a 4-5/8” resaw height. I posted above before the OP changed the 10-305 10in to the 10-325 14in. Pretty sure the OP means the 10-305 10in BS. Owners manual. 14 Deluxe woodworking bandsaw model #10-325. Should of taken pics only 2 screws hold guide on . Worked before I changed blade now cranks into wheel , guess have to go to rikon dealer maybe figure out But thanksfor your time . Maybe another idea..
Got it working now goes up to maxium height… Had to make some adjustments this blade is a little wider than one that come with it but got it now….